Set in the Vaca Mountains is beautiful Lake Berryessa, one of California’s largest freshwater man-made lakes. The grassy, rolling hills that surround the lake are interspersed with oak and manzanita trees, providing visitors with a stunning background to the glorious lake. A variety of flora, fauna and wildlife are found in the rolling hills around the lake. Lake Berryessa is an excellent place to spot wildlife such as deer, eagles, hawks and many other bird species in their natural settings. Visitors can enjoy kayaking and canoeing on this lake while looking out at the Blue Ridge and Cedar Roughs that engulfs them. Another way to take in the surrounding scenery is to hike the trails along the Lake Berryessa Federal Recreation Area. Just a short drive from wine country, Lake Berryessa is ideally located in the manzanita and oak covered hills of northern California. Less than two hours from Sacramento and San Francisco, Lake Berryessa is a popular, smog-free recreation area known among locals as “one the best kept secrets.” With its easy access from the city, locals escape from the busy city life to Lake Berryessa for a little rest and relaxation. Trade in the city noise and lights for nights relaxing under the star-filled skies on the top deck of your houseboat, where the only noise you hear is the laughter of those you are with. 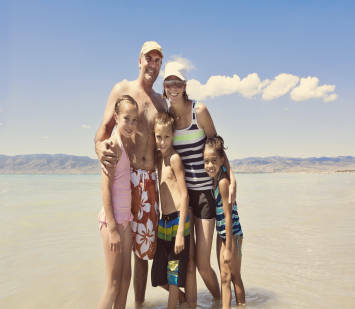 The time spent on the lake will truly be an unforgettable experience full of fun, peace and relaxation amidst some of California’s most beautiful scenery. Visitors staying at the lake also enjoy its convenient location and take day trips into wine country for a bike tour, winery tour, or wine tasting. Lake Berryessa has a full fleet of houseboats that satisfy every taste and every pocket. From the 59’ Deluxe to the luxurious 70’ Titanium, each houseboat comes equipped with a full kitchen, waterslide, entertainment including satellite TV, a DVD player, CD player and stereo, as well as air conditioning and heat if necessary. If you’re in the mood to splurge a little or if you have a larger group, take advantage of the luxurious 70’ Titanium. This spectacular vessel comes with upgraded interior décor, high ceilings, wrap around windows and a large, open layout featuring a living area, dining room table and fully equipped kitchen with Corian countertops. The houseboat features four private bedrooms and two bathrooms with showers only. On the top deck relax in the 6-person hot tub and enjoy the rolling California hills as you sip a cocktail beside the upper-deck wet bar. If the sun gets a little too warm, take a plunge down the waterslide into the cool waters of Lake Berryessa. As you can see there is no need to skimp on luxury when doing a houseboat vacation. Today’s houseboats are more like floating vacation homes – but better. Lake Berryessa is known by the locals as one of California’s “best kept secrets” for year-round recreation. The reservoir, which was formed in 1957 when the Monticello Dam was completed, is 26 miles long and three miles wide. Berryessa boasts 165 miles of oak-covered shoreline for recreational activities, which is more shoreline miles than Lake Tahoe! 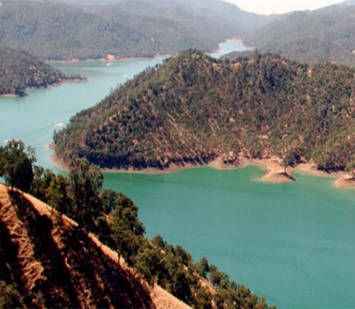 With water temperatures reaching up to 75 degrees in the summer, Lake Berryessa is the ideal place for water enthusiasts and fisherman alike. Whether it’s fishing, water sports, hiking, camping, bird watching or relaxing, Lake Berryessa appeals to just about anyone and everyone. Imagine a day on Lake Berryessa... soaking in the views... and waving to the occasional boater passing you by. Claim your own private cove for a picnic or a relaxing afternoon sunbathing in the warm Californian sunshine. 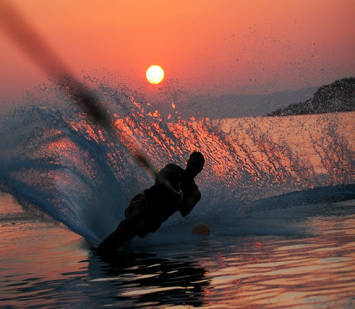 Perhaps you prefer more of an adventure-filled day of waterskiing, kneeboarding or fishing. However you plan on spending your time on the lake, it will certainly not lack in fun.